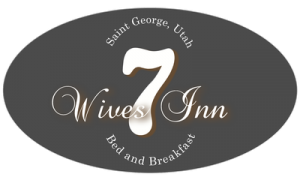 Seven Wives Inn consists of two neighboring homes and a cottage in St. George's historical district. Edwin G. Woolley, who built the larger house in 1873, hid polygamists in the attic via a secret door, after polygamy was outlawed, by the U.S. government in 1882. One of these polygamists was Benjamin F. Johnson, an ancestor of the innkeepers, who really did have seven wives, hence the name Seven Wives Inn. The house next door, built by George Whitehead in 1883, is called the President's House because it hosted some of the early presidents of the LDS (Mormon) Church. Who could blame them for staying there? Esther, George's wife, was said to be the best cook in town! Both homes were built out of Adobe in the late 1800's. The Woolley-Foster home was built in 1873 and is both a historical & federal landmark. The Whitehead home also holds a historical plaque. House sketches by Jon Bowcutt (for more Art by Jon click here).